HTML tables are used to contain a data that should be displayed in a specific logical order to the end user, the following paragraphs will describe both the basic and advanced commands that you need to when working with this element. know. An HTML table is a collection of rows <tr>, headers<th> and columns <td>, each <tr> element is the root of on ore more columns <td>. The following code will go through each row and print the associated values (Each column value is printed per iteration). The following code will help us to retrieve the number of columns and rows of the table. 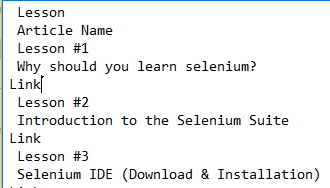 Row ID = 2 | Column ID = 2 | Cell Content = Why should you learn selenium?